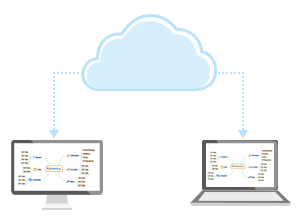 Share files freely between platforms with Edraw cloud sync. Edraw cloud storage allows users to store files online so that users can access them via the internet and collaborate with project team members in real time. There are two types of cloud storage in Edraw: Personal Cloud and Team Cloud. Personal Cloud: For personal use. The files in your personal cloud can be viewed and downloaded only by yourself. Team Cloud: For team use. The files in team cloud can be viewed and downloaded by all team members. To use the cloud, first you need to have an Edraw cloud account. 1. Start Edraw, go to "File" tab and click "Open". 2. 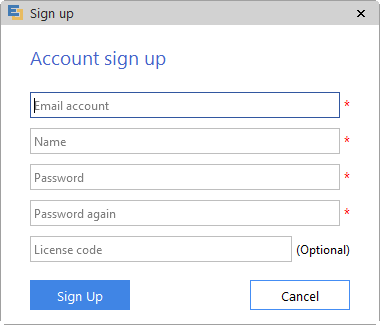 Go to Personal Cloud / Team Cloud, you will see the "Sign in" and "Sign Up" buttons. 3. A pop-up window will show up. Enter you Email, Name and Password, and then click Sign Up button. By the time you click the button, a verification link will be sent to your email. You need to open your email and click the link to finish the verification. After it's successfully created, you can sign in your cloud account. You can save your personal files in the personal cloud. Go to File menu, click Open, and then click Personal Cloud. On the top of the Personal Cloud window, click "Create" button. A new folder will be created. Enter a name for the folder. 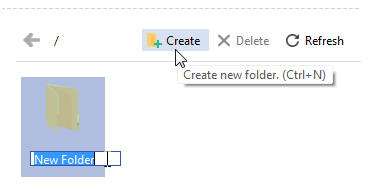 You can build new folders inside an existing folder. To return to the parent directory, click the "Return Arrow". To save a file to the personal cloud, go to the File menu, click Save or Save As, and then choose Personal Cloud. Choose a folder, enter a name and click Save. Go to the File menu, click Open, and then choose Personal Cloud. Double click a file to open. You can use team cloud for real-time collaboration of your project. Go to File menu, click Open, and then click Team Cloud. Click "Create" button on the top. 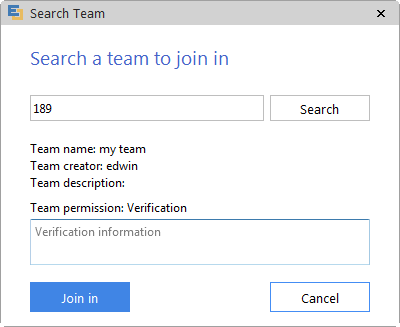 In the pop-up window type in "Team Name", "Description", and choose a team access authority. Click "Create". There are two ways to add team members. 1. Click the team folder, the team member information panel will appear on the right. Enter a team member's email and click the "Add" button. To join a team created by others, first you need to get the team number. 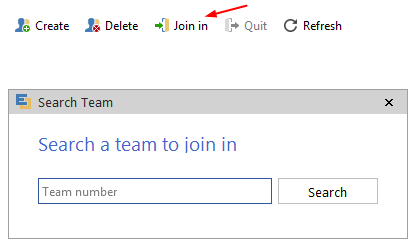 Click the "Join in" button, from the the pop-up window, input the team number, and click search. If the team number is valid, a window showing the team name, team creator and team description will show up. Check up the information and type in the verification message if required. Then click the "Join in" button. 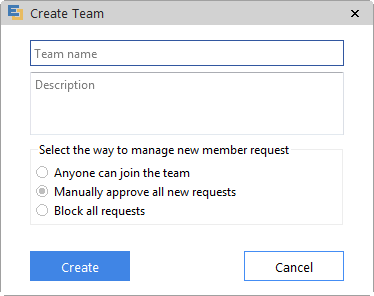 Wait for team creator to approve your request. On the bottom right corner of the window is the Notification panel. Click the Refresh button to update team notification. All new member request information will show up here. You can choose to "Agree" or "Refuse". All team members have the permission to read and download the files in the team. But only members who are authorized have the permission to write and upload. 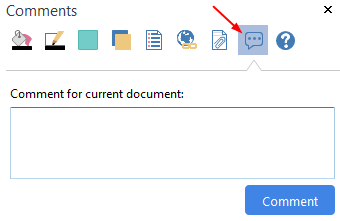 You can use the check box on the right of each member to enable or disable the write permission. To delete a member, click the Delete icon. Only members with write permissions are allowed to save files to a team. To save a file to the team cloud, go to the File menu, click Save or Save As, and then choose Team Cloud. Go to the File menu, click Open, and then choose Team Cloud. Go to Home menu, on the right panel click Comment tab. Enter your content and click the Comment button. To delete a comment, click the Delete button under your message. To reply other people's comment, click Reply button. Edraw gives every registered user 20M free storage capacity. If you need more space, you can click the Add button to purchase more space.